Easter Bunny has always painted all the Easter eggs himself, but this year his eyes are tired! 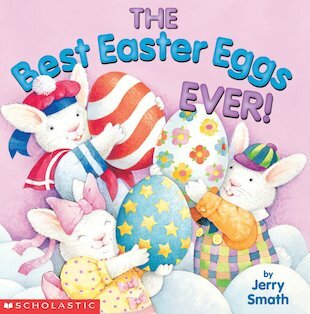 So he holds an Easter Egg Painting Contest for his little helpers, trying to find the best new design. Inspired by a lighthouse at the seashore, Willa Bunny paints bold red stripes on her egg. Jellybean Bunny paints pretty spring flowers on his egg. But Bella Bunny gets lost in the woods, trying to follow drifting clouds. When night arrives, stars appear – giving Bella the idea to paint golden stars on her egg. And who’s the winner of the contest? All three little bunnies! A charming Easter tale from talented author-illustrator Jerry Smath.